New Britain police are hoping you can help them track down this man who they say made off with a bucket of donations being collected by a six year old. A man who stole a donation jar at a local business in New Britain has been identified by police. A man walked into the business on East Main Street at 2 a.m. on Sunday and walked out with a donation jar for the Hearing Loss Association, New Britain Police said. 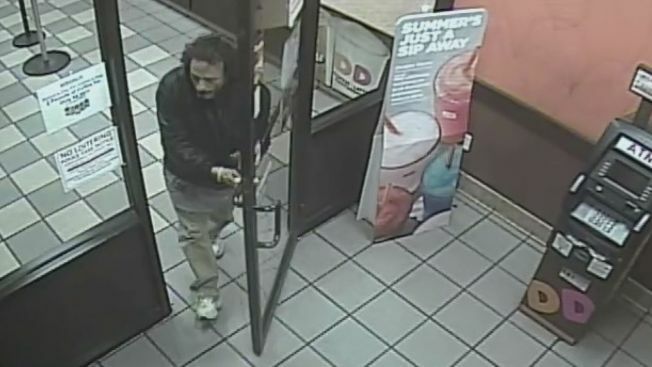 On Monday, police said thanks to the NBC Connecticut report, they received a tip from the public and located the suspect. Police said they expect to make an arrest soon. The money was being collected by "Team Ty" for the annual Connecticut Walk4Hearing. Tyler Ciaffaglione was born with severe hearing loss and wears hearing aids. “We’re fortunate enough to be able to provide them for Ty, but I can’t imagine not being able to give them what he needs,” said Tyler’s mom Wendy Ciaffaglione. To help make sure other moms everywhere don’t have to make that choice, the Ciaffagliones got involved with the Walk4Hearing to benefit the Hearing Loss Association of America. For years they have collected donations meant to fund important research and hearing aids for those who cannot afford them. This year, “Team Ty” placed seven donation jars in the greater New Britain area. However, on Sunday, one of the donation jars with almost $100 was taken from a local business. "I am mad at him," Tyler said. According to his mom Wendy, that anger has nothing to do with the money. “It’s about the purpose and now one less kid with something that they should be able to have it was taken away,” she said.